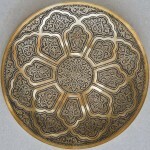 These superb brass platters were made by a master craftsman in Bukhara and are now available for sale by Arastan. They are carved multiple times to traditional patterns, with each platter being a one off piece created from the craftsman’s imagination and never repeated. The heavier, more intricately patterned, platter weighs 1.046kg and is 2mm thick and the other is 0.916kg and 1.5mm thick. They are made of brass with a purity of approximately 80% copper and 20% zinc: the copper is mixed with zinc to become yellow copper, or brass.